Community CPR certification includes Adult, Child and Infant CPR. Individuals are free to train, refresh and test at no charge any time 24/7! The Community CPR certification is nationally accredited and follows the latest American Heart Association, ECC/ILCOR guidelines. 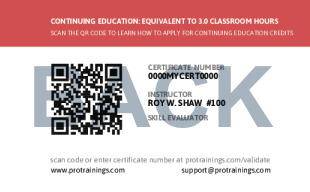 This course is great for people that do not need a First Aid certification. 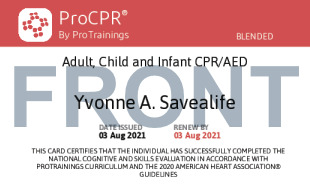 Generally people that need to be certified for Day Care or the general workplace (OSHA Compliance) should take our ProFirstAid certification instead, as it includes Adult, Child and Infant CPR with First Aid. Total course time includes 2 hours and 2 minutes of video training as well as knowledge reviews, final test, remedial help and reviewing downloaded material.